It’s time again for us to hear from Anonymous, that rather well-known yet hacker group whose members remain largely, well, anonymous. 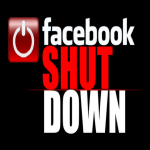 The announcement made today makes clear that whichever member(s) of the hacktivist group have created said call to action are preparing to take down Facebook, one of the most popular and well-travelled social networks and indeed websites on the internet. We can't predict What gonna happen actually just Wait for 5 Nov,2011. im not sure if i agree to this at all. i think that it should be a voted deal here. because im not even sure if i believe that this site is used for the government to get info about us beccause they already have all the information one would need about anybody. they dont need a stupid site like facebook to know about us. so i think u guys are in the wrong here. and making yourselves anonymous doesnt help me want to agree with you either because you guys could be some weird creepy nerds trying to just ruin peoples stuff. it just doesnt really make since in the bigger picture and i dont think you guys should shut it down so soon. people have valuable pictures on here that they may want to save and some dont even know that facebooks being shut down so they would be losing all of the stuff that if they had more time, they coulda saved. think!